Hashtags on Twitter is a great way to increase your organic reach and boost your message to people who aren’t already following you. When implementing a hashtag in your Tweet, you’re making it visible to everyone who’s discussing that subject. Using hashtags on Twitter is like using a megaphone to shout your message, instead of speaking normally, which makes it possible to reach a whole lot more people. So of course, hashtags on Twitter is something that you shouldn’t ignore. However, to get the best results possible with hashtags, you have to know which works the best and which will give you the best results. Popular and trending hashtags are almost always the answer to good hashtags to use, but how do you actually find those? In this article, we’ll teach you How To Find The Most Popular And Trending Hashtags on Twitter. When working with social media, you should always hop on trends. These can give you a boost in your reach and marketing and ultimately give you great results. Hashtags are great to use in order to hop on various trends, so let’s look into how you can find trending hashtags. If you didn’t know, Twitter offers a list of the top trending hashtags, and also a list of trending hashtags based on who you are and which accounts you follow. Things like your current location are also included. These tags are also known as tailored tags. And since I’m in France at the moment, there will of course be some tags related to France. To access these tags, simply visit Twitter, make sure you are on your homepage, and then look at the left corner of your screen. The only thing is that this method will only give you a few trending hashtags. 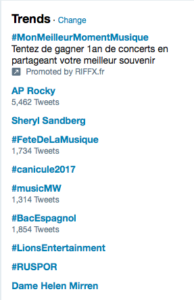 But if you’d like to gain access to more trending hashtags, you can access Twitter from your mobile app instead of your computer desktop. To access trending hashtags on your mobile, go to the search tab. Here, Twitter will present tailored trending hashtags. Tap “See More” to get access to the top 20 trending hashtags. On Twitter, you can change the criteria for which trending hashtags will be displayed as suggestions. By default, the recommended Hashtags are tags based on accounts you follow, who you are and where you are located, as mentioned earlier. With recommended hashtags, however, you can change the location from where you search for recommended hashtags and see trending hashtags in specific cities or in countries as a whole. 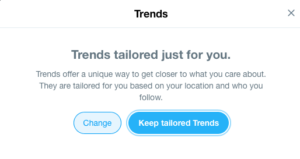 If you’d like to change your location, click “change” and if you’d like to keep your tags tailored, choose “Keep tailored trends”. Either you can search for your own locations or choose any of the suggested nearby locations. You will now get new trending hashtag recommendations based on the location you choose. This is particularly good if you’re trying to break into a new market or a certain area and want to join the conversation. There’s an insane amount of hashtag apps for Twitter out there. And most of the time, that’s a good thing. While more apps mean a bigger assortment of tools, it also makes it harder to choose and know which is the best. The most important thing is that you don’t write your login details to Twitter on any apps that aren’t legit, and even when they are, you should be very careful. Keyhole has great features for free but if you want to have even more rich insights, you are going to have to pay for more advanced packages. …and you’ll be presented with lots of insights about that particular hashtag, such as posts, reach, and impressions. You also get access to a ton of other helpful information about the hashtag. The best part with Keyhole is that they present you with a word cloud of suggested hashtags related to the tag you searched for. This is super helpful when looking for hashtags and keywords within a particular niche. Right above the word cloud, you can change from hashtags to keywords, to learn more in detail what people in your niche are talking about, and how you can find/attract them by using those hashtags. 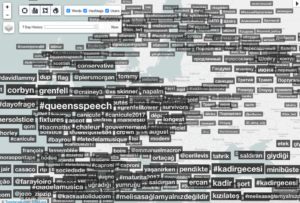 Trendsmap is a tremendously helpful tool if you’re looking for hashtags within a specific area. 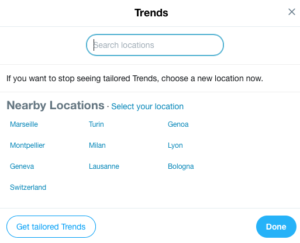 Just like Twitter location hashtags, you can use Trendsmap to search for a location and with the help of the result get a better understanding of how different areas are talking about different subjects and are involved in different trends. Looking for hashtags that are trending in different areas is a great way to connect with your audience in that location. Simply do your research on some trending subjects in the location where you want to target people, and then start a conversation with them about those exact subjects. Another clever little trick is to do research on trending hashtags in different locations and then create Twitter ads, including those hashtags, only targeting that particular area that you studied. Trendsmap presents you with a map of the whole world and then based on how precise you want to be with the hashtags, you can zoom in and see hashtag for very specific areas. 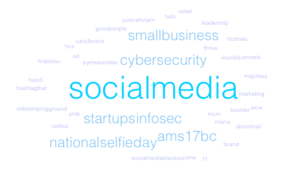 Ritetag is a very powerful hashtag tool for Twitter that has a lot of helpful features. For example, to stay updated with the latest trends at the minute they start emerging, Ritetag has created Trend Alerts, which notifies you when new hashtags emerge for your topic. In addition, the tool also offers lists of trending hashtags and tells you how strong the hashtags are. 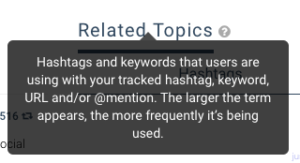 Moreover, the tool also offers you insights on every single tag that you search (or they recommend) so you can get a better understanding of just how good the hashtag is. When using hashtags, there are some things that you should know and think about in order to reach your full potential and get the best results possible, using trending hashtags is definitely one of them. Hashtags are an extremely important tool not only for brands on Twitter but also platforms like Instagram. Hashtags lets you reach your target audience who aren’t already following you or even know about your brand’s existence. And as you’ve probably realized by now, they are super powerful from a social media marketing point of view for faster growth and better results. That’s why it’s important that you use hashtags in the right way, and most importantly – use the right hashtags. Trending hashtags are an essential part of a successful hashtag strategy since it can generate rapid results in a short period of time. Tools like those mentioned above are some of the most helpful and effective for managing and implementing hashtags on Twitter.